Chicago, Christmas Eve 1928. Elliot ‘Lio’ Byrne is drowning his sorrows at the Butterfly Lounge, an illegal speakeasy in the most dangerous neighbourhood in town. The staff know him well: there’s Nancy the waitress, Ernie the bartender, Ralph the pianist and Leroy the doorman. Unfortunately, someone else in Chicago knows Lio’s in town, a mysterious and powerful gangster by the name of Charlie Drinkwater, and rumour has it Drinkwater wants a word with him. As if that’s not bad enough, his wife Maggie, teenage daughter Amy and best friend Cal wouldn’t mind a word with him too: they’d like him to come home to New York. In 2017. 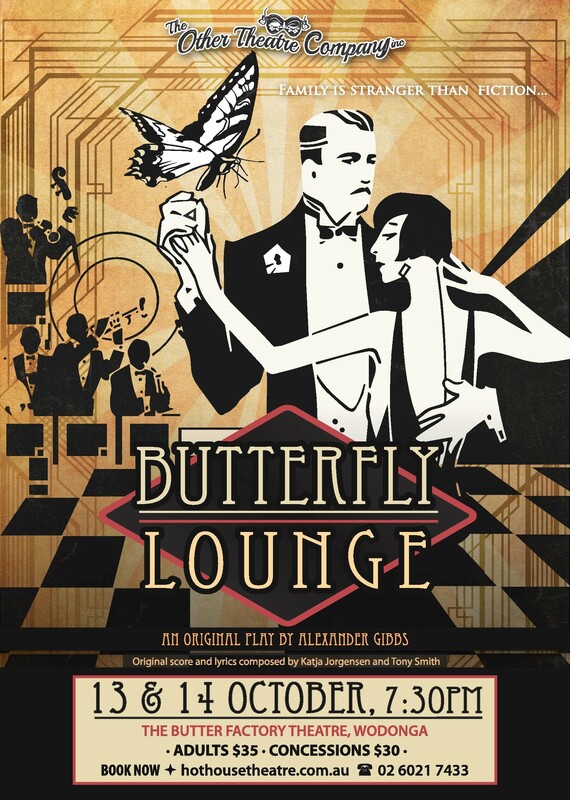 Award-winning local community theatre group, The Other Theatre Company, is pleased to present Butterfly Lounge – An original play written by local playwright Alexander Gibbs, complimented by an original score and lyrics composed by a talented young composer Katja Jorgensen in partnership with Tony Smith. Katja and Tony are both incredibly talented local musicians who amongst playing in various local bands, orchestras and musical theatre also teach at the Murray Conservatorium in Albury. Butterfly Lounge is a play that will move and reward the audience with several musical numbers that can only be described as ‘the cat’s meow’. It was first performed on the NSW Central Coast in 2008. The production won the Adjudicator’s Award for Most Promising New Playwright at the Central Coast Theatre Festival in Wyong. We’ve put together an incredibly talented cast, band and crew for the very limited season of 2 performances at The Butter Factory Theatre on Gateway Island at 7.30pm on 13 and 14 October 2017. This production is being judged for the Georgy Awards to be presented at the Eastbank Centre, Shepparton in November 2018. In case you’re the studious type – care about precises chronology and junk like that – it was 2003. I was barely twenty and I had an image in my head that I couldn’t shake: a man sitting in a bar, in the past, who didn’t belong there. Over the years that image morphed from a few pages on incoherent rambling, with the words Butterfly Lounge written at the top, to a one-act embryo without songs and missing a main character that somehow won an award despite its considerable shortcomings. Soon afterwards a lawyer and a Czech walked into the bar (no seriously, they actually did), and roused the play back to life with a full-length musical extravaganza that took the world by storm. Well, it had a piano and some people in Gosford said they enjoyed it. Small victories. But as the saying goes, that was then and this is now. (There’s another saying the goes ‘Never start a sentence with the word but’, but that’s neither here nor there.) Suddenly I live on the Border, and The Other Theatre Company has taken me under its wing. I had a wonderful time last year directing the perennial classics Cosi and Fawlty Towers, and as a reward they’ve allowed me to direct something I wrote myself. The Gullible Fools. I’d like to dedicate this production, first and foremost, to my always supportive wife Lucy. Acknowledgment, however, must also go to the original architects of the Butterfly: to the lawyer and the Czech, Pauline Wright and Jiri Kripac; to Sierra Phillips, Rose Cooper and Andrew Thomson, my original cast; to Clio and Chrissie, the inspirations for Cal; and to Steve Hopely, who was there on that day on ’03 when I foolishly said I wanted to write a musical. Well where do I begin? What a phenomenal 6 months it has been! From the very beginning, to auditions, reversal after rehearsal and finally to the production you will see tonight. It has been an absolute blast and I could not have asked for a better cast, crew and band to have spent these last few months with. Not only has this been an absolutely incredible opportunity, it has been a challenge and a half with a rediculas amount of hard work. This whole thing would not have been possible without the expertise, support and hard work of my evil sidekick Tony Smith. Tony came on Board early in the picture and would step in when it all became too much. Do understand the music and lyrics you are going to hear tonight are 100% original and the combined effort of Tony and I. One of the greatest things about this that I have been able to write and edit these pieces for the vocalist you will hear tonight. To quote one of fabulous cast she says “it’s a unique and exciting experience having a song tailor made just for me.” And I couldn’t agree more. It is always a huge thrill and nervous experience presenting your work to the artists but these legends gave me such amazing feedback and great encouragement and I can’t thank them enough for all the hard work and many hours of rehearsal you have put into these masterpieces. I would like to give a huge thanks to the amazing cast and crew in particular Stage Manager Bean. Producer Ro and my incredible band; Rusty, Alison, Rhys and Tony without you guys this show would not be possible. But most of all I would like to give a a huge thanks to Mr Gibbs for giving me the opportunity of a lifetime to bring something magical to this play.